Operates Quietly: Those that use the Brother 2340CV Cover Stitch machine rave about how quietly it operates compared to other machines. This proves particularly useful for those who create garments professionally in the home. Looper Threading: The color-coded system with thread management guides threads to ensure they are placed properly. The looper system is fast and easy to use to make the process efficient and hassle-free. Cover Stitch: The 2340CV is designed for the cover stitch function. The cover stitch is used in cuffs and necklines and is used to prevent fraying of the fabric. It can be used for either functional or decorative edges. Ease of Use: As a cover stitch machine, the Brother 2340CV is known to be simple to use. It features color-coded threads and adjustable differential feed to make stitching easy. Tension Release: The manual tension release has been reported to be complicated for some users. Separate buttons must be pressed for each thread; meaning up to four may have to be pressed at the same time. The Brother 2340CV Cover Stitch makes it easy to sew garments at home with a professional look. It offers a vast array of cover stitches and comes with numerous accessories. The Brother 2340CV Cover Stitch features 1-2-3 needle options. 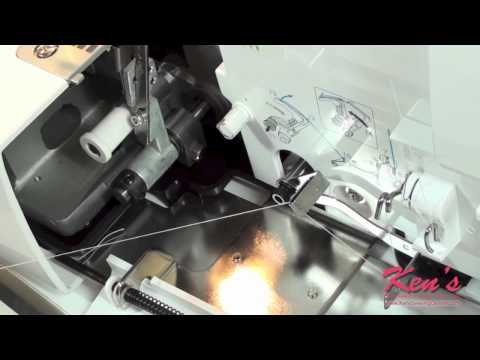 The advanced machine allows for creating a variety of cover stitches on many types and weights of fabric. The 2340CV features color-coded threading, a tri-cover stitch, wide and narrow cover stitches, easy looper threading and an adjustable stitch length. This length can be adjusted from 2.0 to 4.0 millimeters. The cover stitch machine creates chain stitches and decorative styles for casual projects as well as professional hems. The machine can help create stretchy garments such as swimsuits and dance attire as well as interior edges and decorative stitching on common tasks. As its name implies the Brother 2340CV Cover Stitch is made to provide a variety of cover stitches for function and decoration. This stitch provides durability, beauty and protection from fraying. Two or three threads are used for this stitch which does well in cylindrical hems and stretchy fabric. A slide lever is all that is needed to adjust the machine’s differential feed. The adjustable differential feed makes it possible to seam a number of materials including heavy denim fabric and thin laces. It also features numbered guide for specialty threads, thread nets and spool guides. As the machine is used for cover stitching it is able to attach elastic, tape, lace and create circular hems for cuffs and collars. This comes from the fact that is does not cut while sewing like a standard serger. The Brother 2340CV Cover Stitch machine is straightforward and easy to use. It features an easy threading color-coded guide with a backup manual for assistance. Click Here to See Brother 2340CV Serger Pricing, Pictures and Reviews on Amazon! The 2340CV is a useful machine as a backup for standard sergers. Working together, this model with a serger can make it possible to complete whole projects quickly.